The popular Soft Mullet from JM Gillies now comes in three new colours. There are now six colours in the range: blue, gold, plain, bananafish, Guns ‘n’ Roses and Qantas. There are two sizes to choose from – 4” and 6” – and each size comes in all colours. These pre-rigged soft plastic baits have been tested by numerous guides around Australia, and have accounted for some impressive catches. Soft Mullets feel more ‘natural’ to an enquiring fish, and this means the fish will mouth it for longer, giving you extra time to set the hook. Another recent lure release from Gillies is the Aqua Shad range, which was launched last year. Aqua Shads have a special soft touch construction, designed to produce a lifelike swimming action and extreme durability. 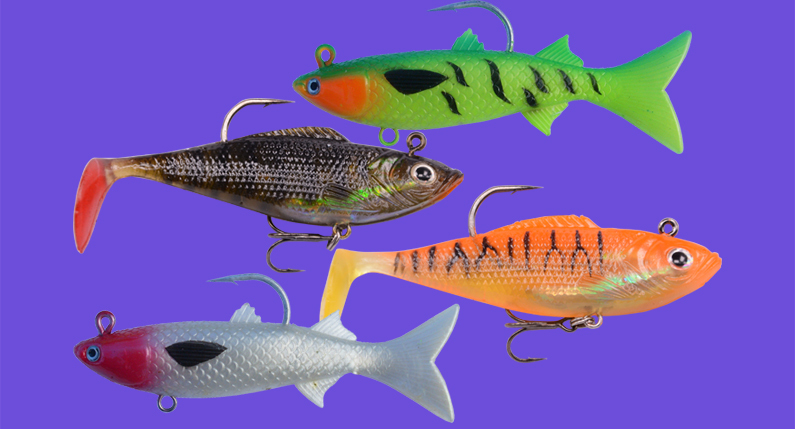 Each Aqua Shad has an embedded holographic effect in the body, as well as lifelike eyes. There are four proven colours in the range (pearl, fire tiger, gold fish and bunker), and they measure 8cm and weigh 14g.